Long-term US interest rates continue to slide despite immense Treasury borrowing, unprecedented in a time of strong economic expansion. 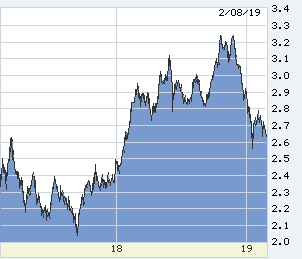 Mortgage rates are falling toward 4.50%, pulled down by the 10-year T-note at 2.63%, its lowest in a year. “Strong” is right, here. The ISM survey of purchasing managers in January found the service sector (think Google, not burgers) still hot at 56.7. The outside world is not. The EU has cut nearly in half its 2019 forecast for the zone (to 1.1% from 1.8%), Italy in recession. China data is unreliable but weak beyond fudging — if the formal numbers are the best that the Party cooks can do, China really is faltering. German 10-year bonds have collapsed in yield, today to 0.089%, and Japan’s again below zero at minus-0.029%, both the lowest since 2016. The ECB and BOJ have not been able to normalize policy and are still engaged in emergency easing; if these economies slip into recession it is not clear what will get them out. The US is the beneficiary, sort of, making it far too easy and cheap for us to borrow an additional one trillion dollars this year. Adding to external concerns especially in the US stock market (45% of earnings are derived overseas), a trade deal with China is not close but the deadline is March 1st, and in a new announcement Trump and Xi will not meet before then. This administration is fond of government-by-deadline, wearing thin in markets. 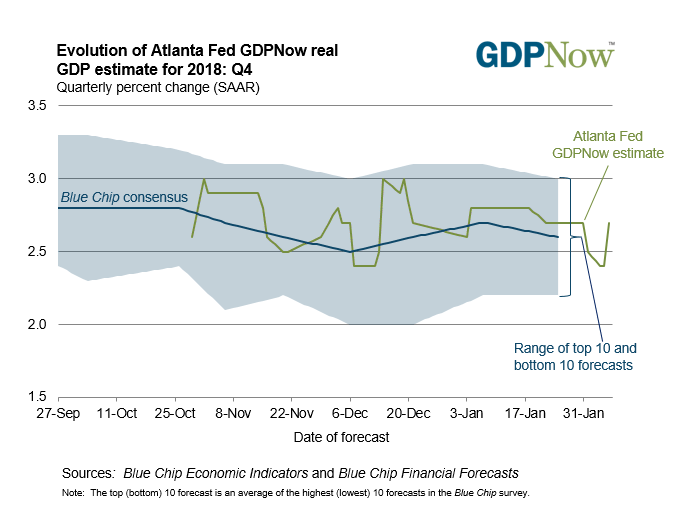 Speaking of thin, frozen US economic policy forces focus on the Fed and its shift to an extended pause. Chair Powell is having a tough time. The Fed’s internal meetings are opaque, nothing leaking, but aftershocks from Powell’s repeatedly poor communication to markets are still rumbling. He has gone silent, or limited to content-free fog, the legitimate refuge of any Fed Chair in an awkward moment. He will testify to Congress at the end of February, fog acceptable there, too. 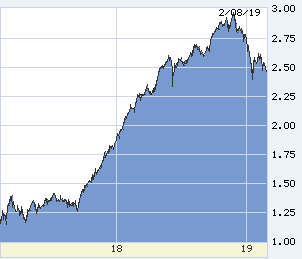 Not acceptable: a poor process of Fed policy formation. Everybody has trouble occasionally with articulation, but the last several months have forced markets to guess at Fed fundamentals. Fed actions are inevitably uncertain, but its fundamentals should be clear. In the Chair’s vacuum, other officials have had a lot to say. The most capable senior people recently crowded to media to say what Powell had not: a significant pause in hikes. But other comments are unsettling. Neel Kashkari is president of the Minneapolis Fed, an inappropriate choice but he is there. He was the architect and public advocate of TARP (the most-hated government financial program ever), then failed badly as gubernatorial candidate in California. Despite his outlier status, I cannot recall a Fed official speaking of the sitting chair with the contempt Kashkari used on Sunday. “I have been urging my colleagues: ‘Hey, let’s take it easy.’” And said that Powell is “coming around” to the view that the Fed should wait. Disagreement is okay, condescension not; still, a puzzling implication that Powell has been the singular and stubborn hawk. Maybe a just bad guy displaying his self-importance. However, I also cannot recall any prior Fed Chair rising to explain new Fed policy after the sitting chair has fumbled. Janet Yellen on CNBC: “We’ve seen wage growth move up some as the labor market has tightened, but not a lot. We’re not seeing strong inflationary pressures, if any, emerge. If global growth really weakens and that spills over to the United States, where financial conditions tighten more and we do see a weakening in the US economy, it’s certainly possible that the next move is a cut.” Then she balanced, mentioning the possibility of a stronger and tighter economy and a return to Fed hikes. Why has Powell been unable to find these words? He was appointed Fed governor in 2011, plenty experienced inside the Fed and markets, but there is a world of difference between experience as a subordinate and as the Chair. Kaplan is not a current voting member of the rate-setting committee, but them is fightin’ words. That’s exasperation. That’s someone without a vote casting a polite but firm dissent. Kaplan looked annoyed as one of those speaking after the December 19th mess, and this speech is at best, um, impatient. He is right on Yellen’s line: we are not pausing before resuming hikes, but standing down until understanding what to do next. I like that view a lot, but I’m biased by agreement and hardly alone — Yellen, Bill Dudley, Lael Brainard have all been aboard with Kaplan’s line of thinking. All the more odd that Powell is MIA. Then just for fun, to politics. I’ve never been a fan of Nancy Pelosi, or any of the careerist leaders in Congress. But she is rising to her once-in-a-lifetime occasion, and not just to devil Donald. She faced a Democratic insurgency which wanted to replace her as Speaker, and whacked them. Now there is a new insurgency, self-styled “progressives” who are not team players, pushing a policy mix appealing only to those over the leftward horizon. Those rebels include the dozens of Democrats certain that if they can just get the party’s nomination, winning the presidency will be easy. See, it is not all about Donald. It is all about the center. 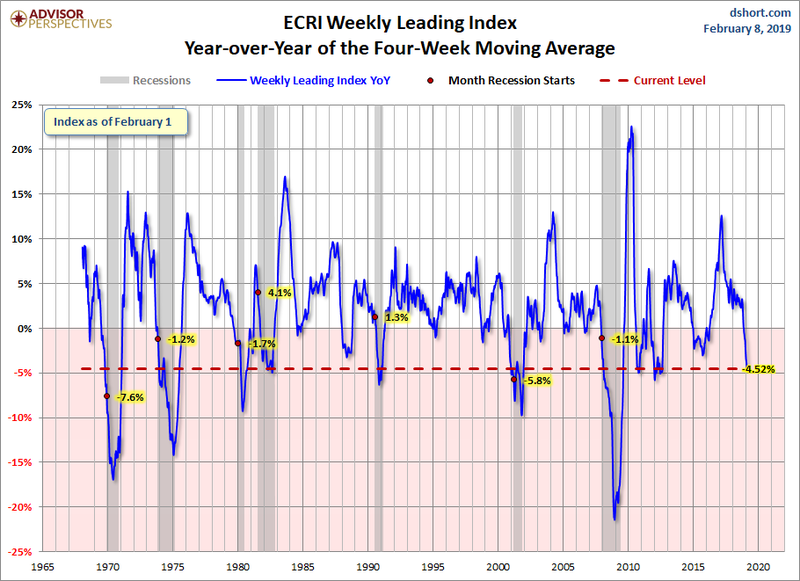 The ECRI is still falling, its highly complex model predicting recession, although its leadership is holding back from making that “call.” Hunch: its model is distorted by the flat yield curve, and (I hope) overweighting the impact of overseas weakness.